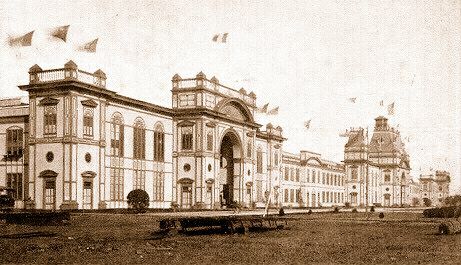 Located at the south side of the Plaza de California, the Panama-California Exposition's Fine Arts Building was an extension of the permanent California State Building, and constructed of reinforced concrete. 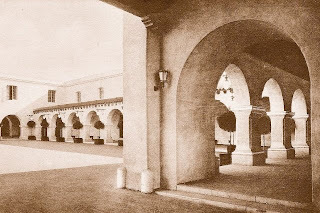 The front of the building consisted of a long arched corridor, reminiscent of San Fernando Mission, roofed with sturdy cedar beams and topped with Mission tile. The main entrance doorway, at the west end of the corridor, opened into a large tile-floored foyer; which gave access to the 136-foot long main picture gallery, containing numerous American works of art. A wooden-railed balcony, at the gallery's east end, contained gilded bas-reliefs representing the four arts of music, painting, sculpture, and ceramics; and a bronze Baroque wall fountain, located beneath the balcony, was set in a niche lined with blue and white glazed tile. At the west end of the picture gallery, over the entrance, was located a circular wrought-iron railed balcony, containing the coat of arms of the City of San Diego. Also accessed from the foyer of the Fine Arts Building was the St. Francis Chapel, designed to represent the small chapels found within the cathedrals of Mexico. Located one level below the foyer, the chapel was floored with heavy terra-cotta tile, and contained rough-plaster walls and a massive wood-beamed ceiling. A raised wooden gallery, at the rear of the chapel, opened from the foyer above and contained the Latin inscription: "Holy Francis, Seraphic Father, Patron of the Missions of California, pray for us". Beneath the gallery was the chapel's entrance, consisting of an arch containing double-doors filled with Mexican wood rejas. The centerpiece of the St. Francis Chapel was an elaborately carved reredos, of gilded and colored wood, featuring a statue of Our Lady and Child, surrounded by busts and statues of several Catholic saints. 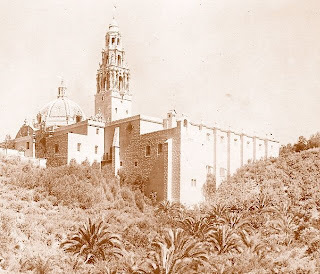 The south facade of the Fine Arts Building featured a heavily buttressed wall, similar to that of San Gabriel Mission; and a Carmelite belfry, containing an old Spanish bell brought from Gibraltar.